The democratic mettle of President Dmitri Medvedev was put to its greatest test this month. Perhaps naively, many of the country's liberals had believed that Medvedev, a doe-eyed and often bashful technocrat, would finally rise up to challenge the unrivaled dominance of Prime Minister Vladimir Putin. After all, they thought, he is technically the commander in chief of the country and he has cultivated the image of a reformer intent on bringing true democracy to Russia. But in the wake of rampant fraud allegations in local elections, Medvedev yet again disappointed the hopeful. It all started when Medvedev surprised the nation by initiating a fresh debate over the state of democracy in Russia. In a breach of the usual Kremlin protocol, Medvedev wrote a policy paper  a liberal manifesto of sorts  that was published in September on the independent news website gazeta.ru. It was seen by many to be a groundbreaking document. Although Medvedev did not criticize Putin overtly  that would have been political suicide  he did lament Russia's isolationism, its vulnerable economy and its "negative democratic tendencies," all jabs at the authoritarian political system that Putin cultivated during his eight years as President. What's more, Medvedev laid out a bold democratic vision for the future. "Russia's political system will be extremely open, flexible and inherently complex," he wrote. "The leaders of the political struggle will be parliamentary parties, which will periodically take each other's place in power." No such system has ever really existed in Russia, and none had ever been promised in such terms. Talk-show hosts and columnists nearly lost their heads interpreting the paper. Was Medvedev actually taking a stand against Putin? Were they preparing to face off for the presidency in 2012? In the weeks that followed, nearly every public intellectual responded to the piece, including former Soviet leader Mikhail Gorbachev and oil mogul Mikhail Khodorkovsky, who had been stripped of his assets and imprisoned under Putin for fraud. Most of them were skeptical. "It is absolutely clear that one leader cannot modernize the country alone, even the strongest leader, if he has no support base of his own," Khodorkovsky wrote from his prison cell in a piece published in the daily Vedomosti newspaper on Oct. 21. Putin enjoys the largest support base in Russia, with his political party, United Russia, controlling 315 of the 450 seats in the Duma. Medvedev's manifesto implied that the party's super-majority would eventually need to be broken up and its control of the bureaucratic machinery dissolved. This prospect, though seemingly impossible, provided opposition leaders with a rallying cry heading into elections on Oct. 11 to choose representatives in 76 of the country's 83 regional governments. But as in every major vote since the fall of communism, reports of vote-rigging, ballot boxstuffing and voter intimidation were rife. In the most blatant violation, one polling station in Moscow recorded zero votes for the opposition Yabloko Party, even though its leader, Sergei Mitrokhin, and his family had all gone there to vote. (Their votes were later found during a recount.) It was a typical landslide day for United Russia. The party claimed victory in virtually all 7,000 races, in some cases by improbably wide margins. Outside the chamber, the members of the Communist Party, the Liberal Democratic Party and the Just Russia Party, which was created by the Kremlin to attract opposition votes, demanded a meeting with Medvedev to urge him to live up to his promises. "We do not recognize the nationwide election results," said Vladimir Zhirinovsky, head of the right-wing Liberal Democrats. "We will not sit in a room with fraudsters." The deputies also called for the resignation of the head of the Central Election Commission, Vladimir Churov, who, in their view, epitomizes all that is wrong with Russia's electoral system. A bearded apparatchik with Coke-bottle glasses, Churov served under Putin in the St. Petersburg mayor's office in the early 1990s. After Putin became President, he paved the way for Churov to lead the election commission, and Churov has since repaid the favor by deflecting the fraud allegations that mar every election in Russia. Medvedev finally agreed to meet with the opposition leaders on Oct. 24. He clearly realized the gravity of the moment. "Let us not allow this to become the funeral of our democracy and our electoral system," Medvedev told the deputies. "Although it is true, I made a point to wear black today, because I knew you would be in the mood for a funeral." 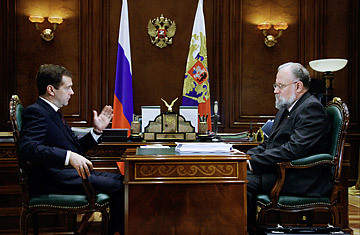 Three days later, Medvedev asked Churov to look into the opposition's claims. Then the President slipped back into his usual complicity. He said the elections had been "satisfactory" and that any claims to the contrary would have to be settled in court. Read "Russia's Medvedev Launches a New War on Drinking." See TIME's photo-essay "Vladimir Putin: Action Figure."